Before closing the curtain on 2017 and getting back to the daily grind for another 365 days, a refreshing holiday get-away should be in order, don’t you think? Although there are still three months before the New Year, you’d be wise to start planning now before every room in every hotel or resort get booked for the upcoming holidays. 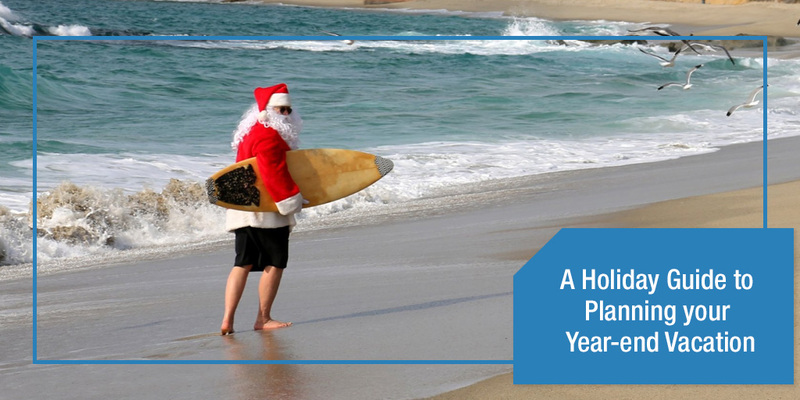 To help you make sure that your holiday plans don’t remain as plans, here’s a step-by-step guide in planning your year-end vacation. While this is the first and most crucial step, it may also be the most difficult task for various reasons such as having an extensive list of places you’re eager to check off your bucket list and you can’t decide which one to choose, or you absolutely have no idea where you want to go. Are you going with friends, family, or both? Do you and your companions want a relaxing get-away or a fun-filled outdoor adventure? How far are you and your companions willing to travel? Deciding your destination months ahead allows you to make the necessary arrangements and gives you ample time to accomplish them. Since you’ve already set your destination, you can now start plotting your itinerary! Can you make sure that everyone is available on those dates? How much are we willing to spend? Is everyone willing to pay for 3 days and one night? Ironing out these issues can help you finalize the length of your trip, therefore help you foresee the possible expenses, prepare a budget, and allow you to book accommodations as early as possible. DIY travelling gives you more freedom. But, if you’re traveling in a large group, it’s worth considering taking a packaged tour since the expense can be split among yourselves, and everything from accommodation to transportation would be arranged for you. However, before you close the book on this argument, it would be prudent if you research the cost if you DIY, and then check for online vouchers, packaged tour, and hotel promos. To give you an idea of how much a DIY trip to your chosen destination can cost, read up on travel blogs that have documented a DIY trip to the same place. Aside from sample itineraries, these blog posts usually include a breakdown of expenses. Take note of the projected expense and compare it to the cost of the packaged tour deals or hotel promo rates you have seen. But if DIY is cheaper, then it’s paramount that you plan at least a month early so that you don’t overlook anything, or if you do, disaster can be averted before the trip. Google search your destination. It’s highly likely that there would already be tons of blog posts on your desired destination with documented itineraries, budget, and even contact details for hotels/resorts and van/boat/tricycle rentals. Make sure to consult more than one blog. List down the possible accommodations in the area. Get their contact information and immediately inquire about their rates and availability. You can also install travel and booking apps to make it easier. Compare the results and book accordingly as soon as possible. Remember you are booking for the peak season, so expect hotels to be fully-booked even a month before. Secure your transportation at least a month ahead. Whether you’re taking the bus, renting a van, riding a boat or an aircraft, or using a private vehicle, it’s always better to arrange your transportation ahead. If you’re taking a plane, watch out for seat sales. List down the things you need to bring. Do this early so you can immediately identify what you don’t have at hand and what you need to buy. This will save you the trouble of panicking and stressing out when you realize you’ve missed or left something so close to the trip date. Additionally, it’s always good to pack light. Since this year-end vacation is all about ending the year and starting the next on a happy note, you should start a separate travel fund for this trip. Who wants to come home to a bleeding bank account after a lovely holiday, right? Instead of your usual Java Chip Frappuccino from Starbucks, how about resorting to Nescafe 3-in-1 for a while? Before getting the latest gadgets, ask yourself if you really need them. Control the urge to splurge on new clothes or shoes. Cut your Spotify or Netflix subscription for a while. If a destination is less than an hour away, walk instead. With Metro Manila’s traffic condition, you won’t only cut your expense but also your travel time. Aside from being a little stingy on your daily expenses, you can also grow your travel funds through other means. Getting a side-hustle or a freelance job is one of them. These days, a lot of remote jobs can be found on online bulletins. You don’t even have to leave your seat to apply for and do these jobs. Speaking of earning money without having to stand up, you may also want to consider selling your old stuff or non-essential things through online pawning. Add up all these little sacrifices and effort, and you’ll soon be able to afford and enjoy that perfect year-end vacation without breaking the bank. Hopefully, you’ve taken down notes or screen-captured this post. May it serve as your guide in making this year-end vacation nothing but relaxing, refreshing, and memorable. Lastly, enjoy your trip and don’t to forget to take pictures along the way!